Do your fondest memories and future vacations always consist of some tranquil, beach setting? Does your idea of a pedicure include dragging your feet through the sand? Does the sound of a steel drum take you back to a time when you were most relaxed or remind you of some coastline where nothing else mattered but that moment? If this sounds like you, it’s likely there’s a large part of your serenity that lies within the sea. The good news for you is that you don’t have to live on the ocean or plan your next retreat, you can bring the warm, airy sensations of the coast home with some coastal living ideas that will transform your home and put you right back on your favorite beach each time you walk through your door. Coastal interior design can mean a lot of different things to lots of different people. If you’re designing for the Caribbean, you may imagine colors that are as vibrant as the spice trade; if you’re thinking a Mediterranean villa, warmer, earthy textures are what you may be envisioning. 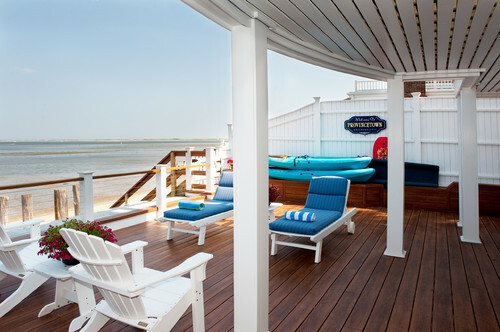 But true American coastal style is clean and light, airy and uncluttered, with an openness that echoes that of the ocean, often perfectly blending the in- and outdoors, with an abundance of sunlight and warmth that amplifies your comfort and provides a cozy ambiance that only a coastal home can deliver. While the kitchen may be the place where friends and family gather most, the living room is the place where you can deliver on casual coastal motifs without sacrificing elegance. If you are lucky enough to live in a place where you enjoy waterfront views, bring the outdoors in with unfettered windows that provide a seamless transition from the indoors and outside. Pass on window treatments that may obstruct the view of the coast and arrange sofas and sectionals around your best vistas. 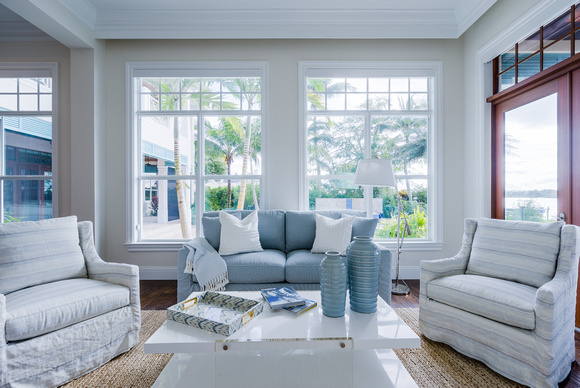 In a coastal living room, like virtually any room with coastal-inspired design, natural light is your best friend and a hallmark of your interior space. Amplify the light in your home with lots of white – white walls, white floors, white ceilings – as the color amplifies light and provides the flood of sunshine that give coastal homes their vast sense of openness. If your home is short on natural light or is covered by dense woods, select elements can be used to your advantage. Smart usage of lamps, sconces and mirrors can provide artificial light that still exemplifies the sun. Coastal furniture is the often the opposite of what most think of when they think of elegance spaces. The best kind of sofas, sectionals, occasional chairs and furnishings are the kinds that can stand up to a wet swimsuit, the sand the dog drug in from the beach, or open windows that welcome in the elements. High-style furniture, such as upholstered sofas, can take their fair share of abuse and can easily be dry-cleaned to maintain their clean aesthetic. 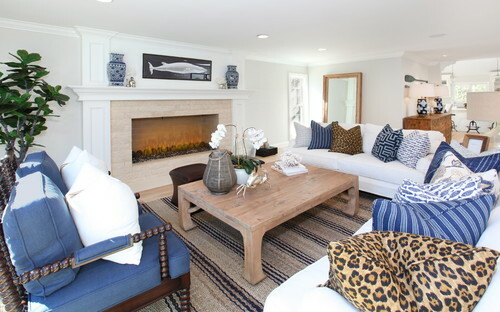 Check out the below picture of a coastal living room designed by Pineapples, Palms, Etc. complete with an upholstered sofa using outdoor fabric, coordinating occasional chairs, and two opposing white wood framed chairs with custom fabric to provide a sense of symmetry to the room. We also love the earthy tones the jute woven rug provides, as well as the wooden x-base coffee table and accompanying large coral coastal décor, and the finishing touches of the nickel floor lamp with white linen shaded floor lamp. Notice that the above living space is not cluttered with unnecessary accessories or décor. The room makes great use of the architectural space, benefits from the natural lighting of the sun, and negates items that could potentially take away from the airy feeling of the room. This coastal living room (below) featured on the Bungalow 5 Instagram shares similar design characteristics as the above space with a separate, yet clean, personal approach. The room also takes advantage of copious use of white – white walls, white brick, white floors, white furniture, white linens, white wooden coffee table base and white floor lamp – while adding hints of blue in the pillow and additional color splashes in the orchard. We also see the use of a slipcovered sofa, a fun chandelier, and sea-inspired lanterns near the fireplace. The above coastal living room clearly echoes clean and simple while the below brings in the breeze with smaller coastal accents such as the white driftwood coffee table and glass jars (window sill) without overdoing it. Beach Style Living Room by Miami Architects & Building Designers Village Architects AIA, Inc.
An effectively designed kitchen should account for the function, mood and personality of the inhabitants. If a complete kitchen overhaul isn’t in the scope of your interior design project, don’t fret; we’ll provide lots of ideas of how to spruce up your family’s favorite gathering place. 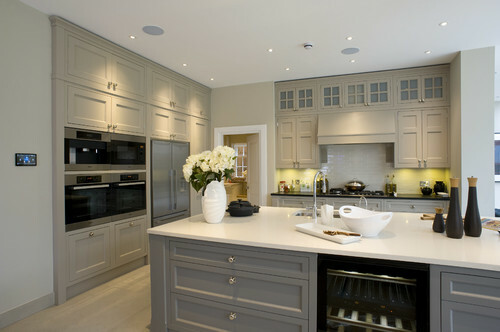 The kitchen should have a natural focal point where the eye is automatically focused upon entering the room. 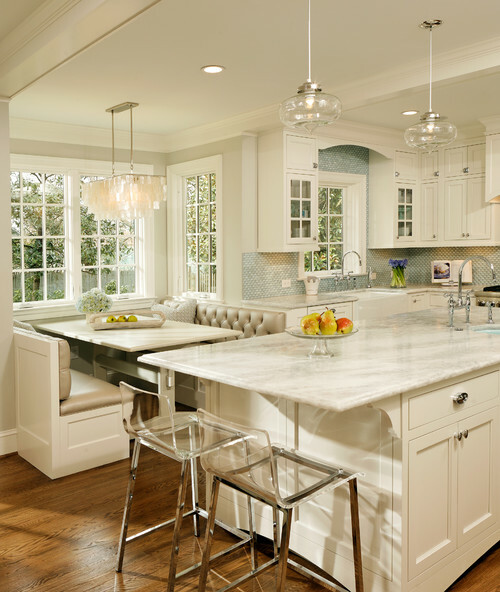 This could be your kitchen’s island or dining nook, as these areas can be spruced up with select coastal décor or pops of color that bring warmth and set the tone. Naturally, your kitchen’s furniture should satisfy your functional needs. If your tables, chairs or other furniture is too big or too small for the room, it’s time to think of something more appropriate. When selecting American-style coastal living-inspired furniture, go for worn or reclaimed woods for your kitchen’s dining area. 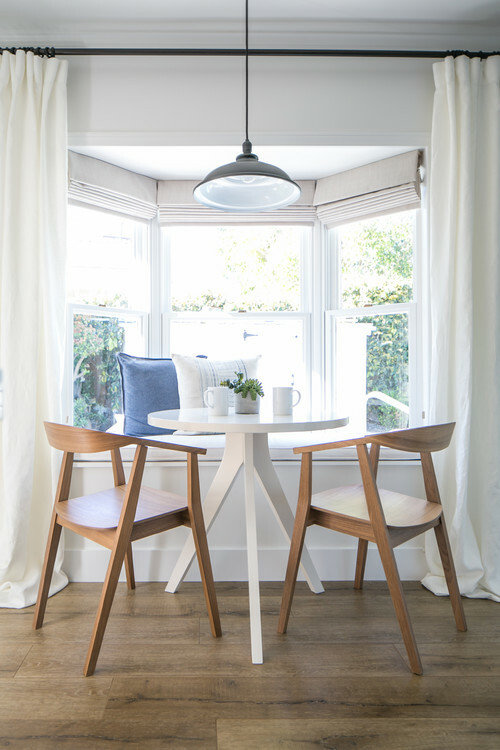 Complement these tables with a wooden arm or side chair, opting for a dining chair in a natural wood color or completely white. If the dining nook in your kitchen is your focal point, consider adding some blue wooden chairs to give the area some nautical influence. Lighting, like furniture, should be carefully chosen based on the functions of the kitchen as well as for aesthetic appeal. Nautical pendant lighting above islands is often a go-to design move, especially those that have a nickel or bronze finish. Of course, making use of natural lighting should be a major consideration, and this can be complemented with accent lighting to enhance textures and room details as necessary. A popular lighting option for dining areas is a small chandelier, as seen in the above and below photos. Traditional Kitchen by Alexandria General Contractors Harry Braswell Inc. 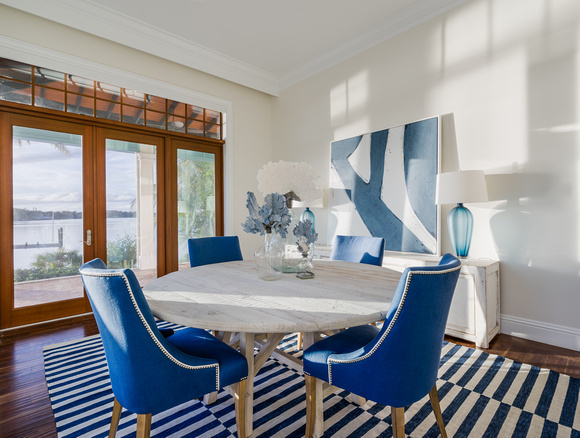 The coastal-inspired dining room starts with the largest piece of furniture – the dining room table – and is built around it. Dining tables that are worn, smooth, or bleached out exude the natural elegance of a piece of driftwood. Reclaimed wood dining tables or dining tables with a wooden base are what you’re after here. Perfectly complemented with simple, yet elegant, white occasional chairs. This below photo is from a Pineapples, Palms, Etc.-designed dining room where the owner wanted to communicate a casual, yet sophisticated coastal dining space. Slipcovered benches in place of chairs were used to create more intimate seating for guests, and the serene colors of the ocean are displayed in the artwork. An aqua blue decorative glass piece complements the art and light blue stripes on the benches, and sits atop an old wood table that was painted in high gloss white lacquer to make it clean, light and modern. In the below oceanfront dining room a reclaimed dining table is used as the centerpiece and is adorned with two decorative white vases that provide balance and simplicity to the room. It makes use of more traditional, modern dining room chairs, and is finished with a contemporary nickel chandelier that hovers perfectly above the table’s center. Mood is often the major consider when designing for the bedroom. As with other coastal-designed rooms, the bedroom lends itself to lots of whites and blues throughout. These foundational color palettes will set a calming and relaxing mood that you’d want in a place you rest your head each night. an accent color that is used thinly to add vitality and flair to the room. 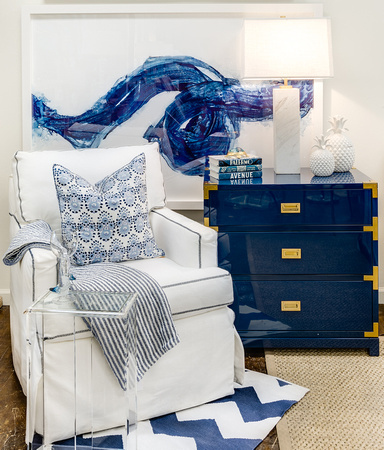 For example, the below Instagram post by Bungalow 5 utilizes a dominant white on the walls, sheets, side tables, chandelier and lamp shades to set the foundation for “beachy perfection.” The bedroom uses two secondary colors as seen in the natural jute rug and window shade as well as the sea-inspired blue fabrics on the bed, lamps and occasional chair (far right). The owner adds a personal accent color of red as is seen in the pillow, the bed linens and curtains, on the base of the occasional chair and the flowers in the bedside vase. The below bedroom by Waterleaf Interiors makes use of more traditional coastal bedroom colors, sticking to whites and blues. 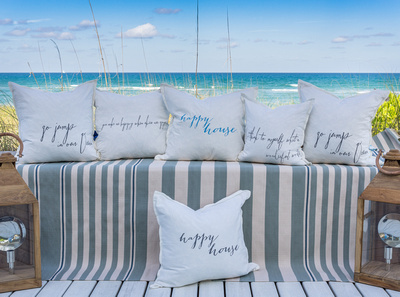 The pillows feature prints by John Robshaw, sea-inspired wall art, table lamps with white linen shades, and a bedframe and linens in a clean white. Get your bedrooms ready for the holidays with #johnrobshaw! Looking to create your own spa-like oasis in your master bedroom? With the right use of fixtures and decorative details, your master bath can be your getaway inside your getaway. If you’re starting from scratch, your bathroom’s centerpiece can revolve around a deep soaking tub. It’s wise to put some shelving nearby your tub to get quick access to plush towels, aromatic soaps, and your favorite brand of vino. Hints of coastal-inspired texture can be added to the bathroom with the use of natural or earthy materials such as a woven hyacinth ottoman or decorative coral bottle, and a calming piece of wall art can add soothing blues and help to accent the room. But the true openness of your bathroom lies in the view, especially if you are afforded one of the ocean. In the below two pictures, we see how the bathrooms immediately focus the eye on the outdoors, with sweeping views of Mother Nature. When it comes to creating the ultimate sense of relaxation, nothing beats an outdoor living area. These can include an outdoor living room, an outdoor dining area, or just a place to kick your feet up and enjoy your coastal atmosphere and allow the stresses of the day to fade away. When creating and designing your outdoor dining area, consider how much shade you’ll want. Positioning your outdoor dining table under a covered patio or pergola will allow you to reduce the amount of sun and heat from overhead. For an added aesthetic touch, hang lightweight fabric panels (we suggest white) to provide added ambiance but also to block the sun’s powerful rays while still allowing plenty of natural sunlight to shine through. If your space allows, the installation of ceiling fans can keep your outdoor space comfortable even on the hottest of summer days. For seating options, consider durable outdoor occasional chairs or outdoor slipcovered chairs that are washable, stain resistant and can withstand all the sun and water that your space affords. Many of the above principles on shade and sunlight can be applied to your outdoor living space as well, ensuring that you have the functional, yet aesthetic, touches that make your space comfortable year-round. For seating, you don’t have to sacrifice comfort for durability if you take advantage of outdoor slipcovered sectionals or sofas. 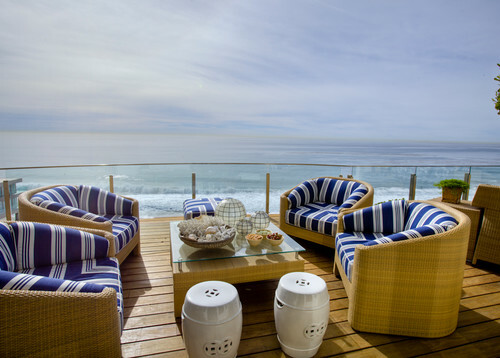 And what’s an outdoor living room without an all-weather wicker chair, providing added texture to your area? 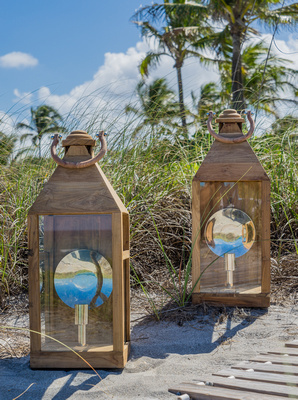 If your outdoor living space affords electrical connections, add some nautical charm with glass and metal lanterns. We particularly enjoy the use of these with a dimmer to set the mood during those romantic nights under the moon. Finally, layer in some decorative elements such as a whimsical mirror and an outdoor rug. You’ve reached the end of our Coastal Interior Design Guide, now you’re ready to create your own interpretation of what your beach house will be like. With some inspiration from the above pictures, your own research into other inspiring coastal rooms (Pinterest is a great place for this! ), and a little tinkering, you will be getting calls from your friends to help design their homes! Your friends will just have to wait as you’ll be too busy lounging in your coastal outdoor living room, bathing to the sounds of the ocean in your tranquil spa-inspired master bath, or finishing up the last few chapters of Robinson Crusoe in your newly appointed bedroom. For more coastal-inspired design tips, check out the Pineapple Girls blog for the latest ideas for your home.